Late last night when I returned home after a long journey abroad, I found my good friend Albert "You Can Call Me Al" Weinstein waiting for me. He wanted to talk to me urgently. "Tomorrow", he began, "it will be exactly 30 years ago that the first CD was released and I have always wondered whether the date on which this event took place was simply chosen accidentally or was carefully planned. During the past few months I have been examining your Target CDs while I was looking after your house during your absence, performed numerous complicated tests and calculations on them and finally found the answer." "The problem is now solved", he said to me, "the answer is easy if you take it logically: it is found in the design of the Target CD itself!" 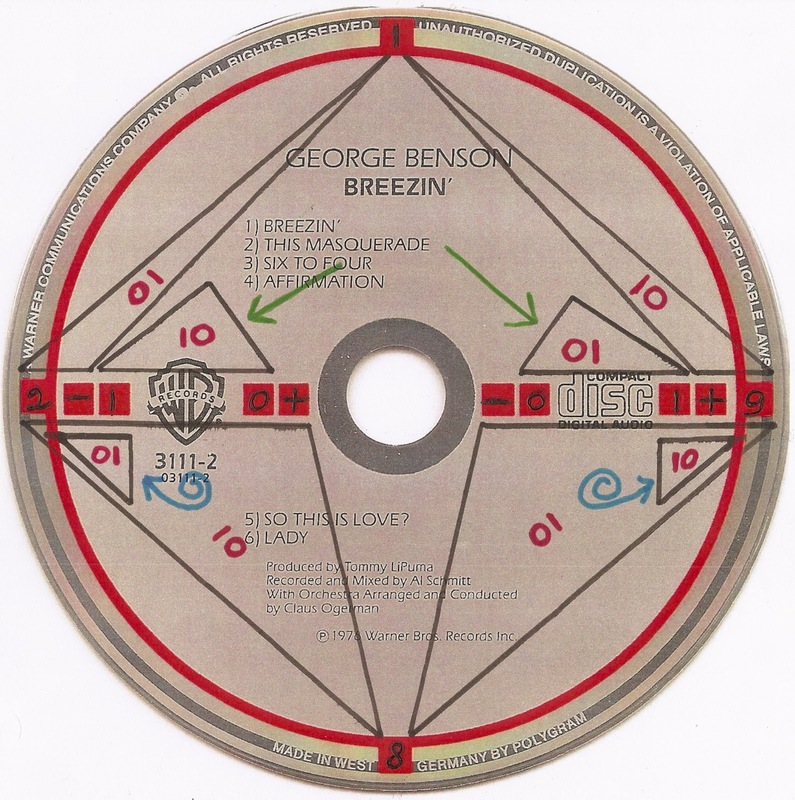 "Take a look at this CD", he went on and began explaining his new-found formula. " 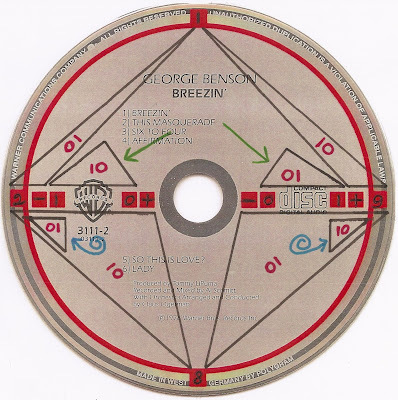 I started with writing the release date of the first CD (10/01/1982) in the red squares: the month (10) in the horizontal squares at the left and right of the record label logo, the day (01) in the horizontal squares at the left and right of the Compact Disc logo and the year (1982) in the four outer squares at 12, 3, 6 and 9 o'clock respectively. In the remaining squares I put the operators minus (-) and plus (+). Then I drew eight black triangles of which the four larger ones each connect two figures with one operator in the three corners. The two triangles marked with a green arrow both concatenate two figures at the base line, while the figures and operator linked to the two triangles marked with a blue swirl are placed above the upper line of the triangle..."
He paused for a little while and looked at me to see if I was still following his explanation. "Then I added, subtracted or concatenated the two figures of each triangle and wrote the result in red inside the corresponding triangle. As you can see, all these calculations (1+9, 9-8, 8+2, 2-1 in the four large triangles, 1¦¦0, 0¦¦1, 2-1, 1+9 in the four small ones) either result in 01 or 10, thus consisting only of the symbols '0' and '1' which are also the only values used in the new digital medium that was introduced 30 years ago. My new theory therefore states that the release date of the first CD was meticulously planned and was not chosen by accident." All the time I had been listening to Al's theory without saying a word as I was getting more and more upset by the fact that he had ruined one of my Target CDs. After a few minutes, when I was able to talk again and asked him why he hadn't discussed this with me before so that I could have given him a Target CD in cat toy condition to prove his theory in stead of the mint copy he had used now, he looked at me with his big brown eyes and said: "Oh no, that wouldn't have been enough. You see, we scientists have to perform experiments over and over again until we are sure that our theory is valid under every possible circumstance." He paused for a moment, looked at me with twinkling eyes and then cried out with triumphant voice: "Dig it?" In panic I ran to the room where my collection is housed and what I found there defied all imagination: all my Targets CDs were lying on the floor, many of them were taken out of their jewel case and had undergone Al's crazy experiments. I immediately sensed that the damage done by Al was irreparable. All of a sudden a calm came over me. There was no hesitation in my mind when I picked up the gun that I keep in a drawer to scare away burglars that might target my collection and walked back to the living room where Al was sitting complacently in my sofa, savoring a brandy and having a cigar. A second later a shot rang out and Al's red face splashed into the sky. I went back to my CDs and sat there for hours, silently overlooking the battlefield that Al had left behind. Then suddenly the doorbell rang. It rang again, louder and longer this time. That had to be the police, coming to arrest me. I walked to the front door, preparing for the worst. When I opened up I saw Jack the postman who alway rings twice if he has a parcel to deliver. He smiled when he handed me the envelop and said "Here are a few more for your collection! Enjoy!" The first CD is a variation of the MPO pressing of Michel Jonasz's En Concert Au Palais Des Sports. In the plastic hub the text COMPACT DISC MPO FRANCE 07 is embossed. The CD came with inserts that were printed by Record Service in Alsdorf, Germany. The second CD is a variation of the same title but this one was made in Germany as is evidenced by the text 'Manufactured in Germany by Record Service Gmbh, Alsdorf' that is printed around the perimeter. Needless to say that this variation also came with Alsdorf inserts. This is the first time I have seen a German pressing of a Target CD by a French artist that was originally manufactured by MPO in France. Based upon the fact that many MPO pressings of CDs by non-French artists like Chicago, Phil Collins and Prince, can also be found in this German silver stock variation, with either plastic or full silver center, I have every reason to believe that this must also be the case for all other MPO pressings of the Michel Jonasz and Véronique Sanson Targets.